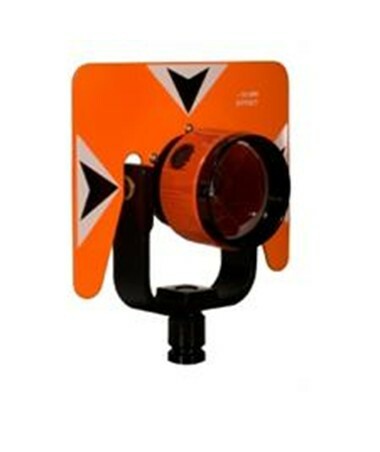 The Sokkia Strobe Prism Assembly 724100 works perfectly in low light conditions with its strobe prism. The prism has a 62 mm diameter and a 0/-40 mm offset with all its electrical cables tucked away inside a canister. Its strobe light operates for over 20 hours on just one CR-1/3N battery. This assembly includes a 5/8 x 11-inch thread and a fluorescent orange target with dimensions of 5.5 inches by 7 inches. It also has a single tilting mount with a bayonet base. And survey professionals can store this entire assembly away in the included protective carrying case.